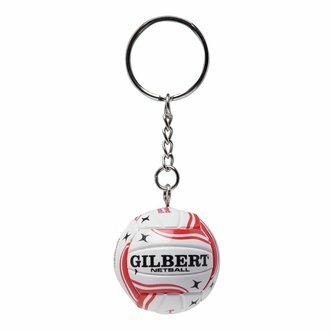 Decorate your keys and make them easier to find with the Gilbert England Netball Keyring in White and Red. This official mini Gilbert England keyring features a keychain to attach to set of keys or perhaps even a bag and is soft and stuffed with polyester. The brand badge is printed on one side of the mini netball in black whilst the detailing is red and features the words 'England Netball'. This is also the ideal item to be a gift or prize.